WOSU News Reporter Adora Namigadde poses for a photo with family members behind her and Ugandan treats, including mandazi (right side), in front of her. WOSU News Reporter Adora Namigadde talks about good times with family, friends and the yummy Ugandan treat mandazi. Namigadde was raised on mandazi as a dessert after family meals and at holidays and other special occasions. “We would definitely have it with every sort of big holiday, big meal,” she said. “My family’s Catholic, so Christmas dinner, you’re going to have mandazi. Easter dinner, you’re going to have mandazi – someone is going to bring mandazi to the table. 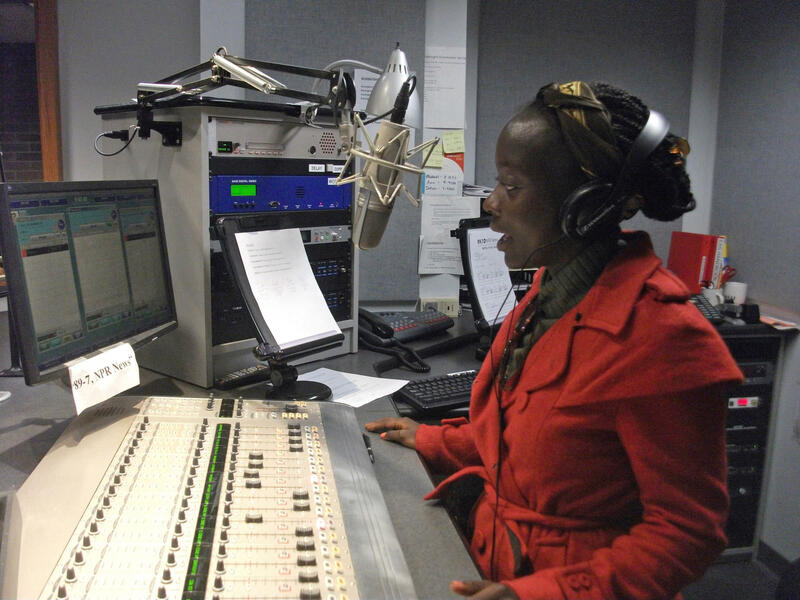 WOSU News Reporter Adora Namigadde works on a story in our studios. As a teenager, Namigadde learned all about mandazi when her mother taught her how to make Ugandan dishes and other favorites. “About then I was just like, ‘I need to learn how to make everything my mom knows how to make before I go off to college,’” Namigadde said. For Namigadde, mandazi is more than a sweet, yummy treat. Mandazi has always been about celebration. On Thanksgiving Day, hear family bread stories from cultures around the world, along with beautiful American music during Thanksgiving with The American Sound – Let Us Break Bread Together at 2 p.m. on Classical 101. Then keep listening at 3 p.m. to enjoy Thanksgiving with the American Sound – Pilgrim's Rest, an hour of tranquil American music to fill your Thanksgiving with peace and joy. For Columbus attorney Stephen McCoy, bread means family. And not just any bread, but the traditional Armenian braided sweetbread called choreg. And not just any choreg recipe, but the recipe his great-grandmother carried with her through war, through genocide, across two continents and in utter poverty to a new life – and a new family – in America.